Despite its rich culture and outstanding natural beauty, Republic of Macedonia remains relatively undiscovered by foreign tourists. Life continues at a slower pace in this natural setting of mountains, lakes, and rivers. Tradition and local customs rule the country's idyllic villages, tiny pockets of hospitality scattered across a rugged region. Start your Macedonia holiday at the capital city of Skopje, an easygoing urban center offering good dining, shopping, and entertainment options. The city also serves as a convenient base for hiking and biking trips through the surrounding countryside, which is noted for its ancient monasteries, mosques, and archaeological sites. Skopje: The country's eclectic capital, Skopje seamlessly blends a broad spectrum of cultures and religions, historical attractions and modern urban liveliness. Ohrid: A picturesque addition to your Republic of Macedonia itinerary, Ohrid boasts a jaw-dropping turquoise lake, World Heritage Site, and plenty of historical attractions. Struga: Differing slightly from its older brother Ohrid, Struga is the country's hidden gem. Quiet beaches, historical cave churches, and fewer crowds make it an ideal destination for those seeking out a peaceful getaway. Berovo: Famed for its lush forestry, historical monasteries, wood craftsmanship, and production of cheese, the small mountain town of Berovo is scenic and peaceful, a perfect retreat on a Republic of Macedonia holiday. Lake Ohrid: This World Heritage Site is among the most popular places to visit in Republic of Macedonia. 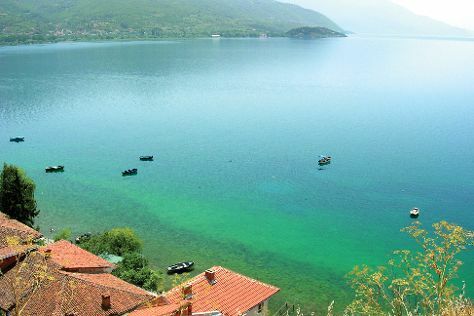 Lake Ohrid's dazzling beaches and important historical sites are not to be missed. Lake Matka: Soak up a little slice of paradise at Lake Matka, with its spectacular man-made lake, surrounding scenic caves, and medieval ruins. Old Bazaar, Skopje: Get a taste of the traditional by including the Old Bazaar in your Republic of Macedonia sightseeing. The historical site of all commercial trade, it still buzzes with merchants and cafes. Monastery of Saint Naum: This 10th-century monastery lures visitors with its collection of religious artwork, colorful frescoes, and 18th-century wooden icons. Macedonia Square: Tip your hat to the country's claimed national hero Alexander the Great with a stop at Warrior on a Horse, a statue erected in his honor in this square. Macedonia Square: Ranking highly among things to do in Republic of Macedonia is a visit to Macedonia Square, the largest plaza in the country. Revealing hints of the country's communist past juxtapose important historical monuments, making the square an important testament to the national heritage. St. Jovan Kaneo: The delicate lines of this 13th-century Orthodox church perch effortlessly on a rocky cliff above the scenic lake below--all set against a panoramic mountain backdrop. Millennium Cross: A testament to the country's Christian roots, Millennium Cross stands proudly on the top of Mount Vodno overlooking the capital. Memorial House of Mother Teresa: Memorial House of Mother Teresa commemorates this important religious figure in her hometown of Skopje. The Stone Bridge: The fascinating 15th-century Ottoman Stone Bridge represents an important piece of architecture and infrastructure, as well as a symbol of perseverance. When planning a family holiday in Republic of Macedonia, consider avoiding the crowds of the busy cities and bazaars--which may offer little in the way of kid-friendly activities--and opt instead for the calmer seaside city of Ohrid, where children can pass the time exploring historical sites, playing in the sand, or swimming in the peaceful turquoise waters. Alternatively, the nearby city of Struga is less-frequented than Ohrid, offering even more rest and relaxation under the Balkan sun. If you're looking for more outdoorsy Republic of Macedonia vacation ideas, head to Mavrovo, where the country's largest national park offers plenty of hiking and skiing for the whole family. If you're traveling with kids, plan your Republic of Macedonia itinerary around the country's rich natural beauty and fascinating historical attractions. When visiting the stunning seaside town of Ohrid, kids will love swimming and playing around Lake Ohrid, as well as exploring the nearby historical ruins at Plaoshnik. Visit Bay of the Bones Museum to see a recreated prehistoric settlement that's sure to fascinate kids of all ages. You can also take advantage of the abundance of paved pathways in nearby National Park Galicica; look out for wildlife including bears, boars, wolves, foxes, eagles, and lynx. In Mavrovo National Park, explore 730 sq km (282 sq mi) of forests, karst fields, gorges, and waterfalls, or, if it's winter, hit the slopes, where you'll find trails for all skill levels. Take a day trip to 11th-century Monastery St. Jovan Bigorski, where little ones can explore tiny scenes with over 700 human and animal figures in the impressive carved iconostasis. If you're considering a family trip to Republic of Macedonia, take comfort in the knowledge that the country is very accommodating towards children. Macedonians are exceptionally welcoming to families with little ones and are very tolerant and relaxed. Due to the low costs, traveling in Republic of Macedonia with kids is also very budget-friendly. Republic of Macedonia's cuisine bears strong resemblance to that of other southern Balkan nations. Grilled meat is a staple here, with side dishes usually ordered separately. National specialties include "shopska," a mixed salad of cucumbers, tomatoes, and grated cheese similar to feta; "ajvar," a red paste made from roasted peppers and tomatoes; and "tarator," a yogurt, cucumber, and garlic soup served cold. The national dish is "tavce gravce," consisting of beans, paprika, and other vegetables served with cut sausage and bread. Fish is hard to come by, unless your Republic of Macedonia trip includes a stop in seaside Ohrid, where the trout is a local delicacy. Do considering sampling "rakija," a strong grape brandy considered the national beverage. Macedonian wine is a not-so-guarded secret, offering excellent vintages at affordable prices. Beer lovers will also find a few local breweries to try out. Shopping enthusiasts on a tour of Republic of Macedonia should look no further than the grand bazaars of Skopje and Ohrid. The country is brimming with markets selling anything and everything--from dried peppers to shoes, fruit and vegetables to fake designer sunglasses. Stop by Old Bazaar, Skopje for a traditional experience at the country's oldest commercial trading spot. Ohrid is well-known for its exquisite selection of pearls and jewelers, as well as Macedonian Orthodox paintings. In its antiquity, the Republic of Macedonia was largely part of the kingdom of Paeonia, home to an eclectic mix of inhabitants. In 356 BCE Philip II of Macedon combined Paeonia and many of the surrounding regions, the rest of which were then conquered by his son Alexander the Great, who--though arguably of Greek rather than Macedonian origin--enjoys an enduring status of national hero, as evidenced at his statue in Macedonia Square. In 146 BCE the Romans established the Province of Macedonia. In the 6th century Slavic peoples settled in Macedonia and began raiding the Byzantine territories. In 1014 Byzantium restored control over the Balkans and Macedonia for the first time since the 7th century. In the 13th century, a strengthened Bulgarian Empire gained control temporarily, but eventually fell under Byzantine powers once again in the 14th century. When this power waned, Ottoman Turks took over, and the region remained under control of the Ottoman Empire for five centuries. In the 18th century Macedonian nationalism started to emerge as part of the Bulgarian National Revival. By the end of the 19th century, several movements evolved whose end goal was an autonomous Macedonia. After the Balkan wars of 1912 and 1913 and the disintegration of the Ottoman Empire, Macedonia was appointed to Serbia, which, in 1929, grew into the Kingdom of Yugoslavia. In 1934 a special resolution was issued requesting recognition of a separate Macedonian nation and language. During World War II Yugoslavia was occupied by the Axis Powers, whose harsh rule led many Macedonians to support the Communist Partisan resistance movement. A National Liberation War drove the German forces out of the country by 1944. In 1944 the People's Republic of Macedonia was proclaimed as part of the People's Federal Republic of Macedonia, and then in 1963 declared the Socialist Republic of Macedonia. In 1991 the state peacefully seceded from Yugoslavia and dropped "Socialist" from its name. On September 8, 1991 the state officially declared independence. In Macedonian culture, as in many cultures, the young are expected to show reverence to the elderly. Upon greeting people, it is common for men to shake hands and women to kiss. If you are lucky enough to be invited to a local's home on your Republic of Macedonia trip, keep in mind that visitors are generally expected to remove their shoes at the entrance of a house or apartment. Travelers are cautioned that many Macedonians hold strong political opinions regarding their neighboring countries, it is unadvisable to mention relations with Bulgaria, Albania, or Greece, or the Republic's military involvement in any capacity. In the interest of being respectful to your new hosts, politics are best left out of conversation. Many of the country's festivals center around religious occasions or critical events in the country's long struggle for independence. Orthodox Easter (which falls in March or April) and Independence Day on September 8 are the two most important celebrations. If your Republic of Macedonia itinerary takes you through Skopje between the end of November and the beginning of December, you may want to catch the annual Taksirat Festival--one of the biggest winter music festivals in Eastern Europe. As you plan your tour of Republic of Macedonia, keep in mind that the country has three distinct climatic zones. While the mountainous region has long, snowy winters and short, cool summers, while the temperate Mediterranean valleys of the Vardar and Strumica rivers can get quite warm in the summer, with temperatures up to 40 C (104 F). Most of the country, however, enjoys a continental climate, where the summers are hot and dry and the winters moderately cold and wet. Getting around within cities and towns on a Republic of Macedonia holiday is mostly done by car, either by rental or by taxi. For tourists, taxi is the preferred method, though you should negotiate a price in advance. Do keep in mind that prices may be higher in summer, especially in touristy areas like Ohrid. If traveling by car, make sure the tires are in good condition and don't be surprised if weather in the mountains differs significantly from lower elevations. If you don't have a car, intercity transport can be by bus (more frequent but crowded in summer) or by train (with slower service and more limited routes). If Lake Ohrid is on your Republic of Macedonia itinerary, you'll find plenty of boats available for inexpensive charter. You're likely to hear several different languages on your Republic of Macedonia tour, as it's home to many ethnic minorities. The majority of inhabitants speak Macedonian, with a solid quarter speaking Albanian. You may also catch some Turkish and Serbo-Croatian in the mix, and you'll find that many young people know a bit of English. Tipping is not considered essential, but it is welcome.